But when he gets to the salad, he discovers that there’s a carrot in it. And Escargot hates carrots. But when he finally tries one—with a little help from you!—he discovers that it’s not so bad after all. Make a salad! Here is a link to 20 kid-friendly salad suggestions from Today’s Parent. Get a pet snail! Here is a link to keeping a pet snail safe and healthy. Create a snail craft! Here are a dozen cute ideas for making fun snails. Use the Escargot Activity Kit! Loads of fun ideas to pair with the book. Funny, charming and interactive, ESCARGOT was utterly endearing. The illustrations are a hoot and the dry witticisms are perfectly tuned for the ears of little listeners as well as adult readers. The concept of taste-testing feared foods is so subtle and sweet that it will not strike kids as cloying or message-y. Sweet, sincere and tenderly vulnerable Escargot is the most expressive and adorable picture book snail I’ve ever met. Coincidentally, I recently finished reading The Sound of a Wild Snail Eating, an incredible memoir/meditation by Elisabeth Tova Bailey ideal for sustaining or restoring your sense of wonder about the natural world. Also highly recommended! For a complete list of books with resources, please visit Perfect Picture Books hosted by the incomparable Susanna Leonard Hill. 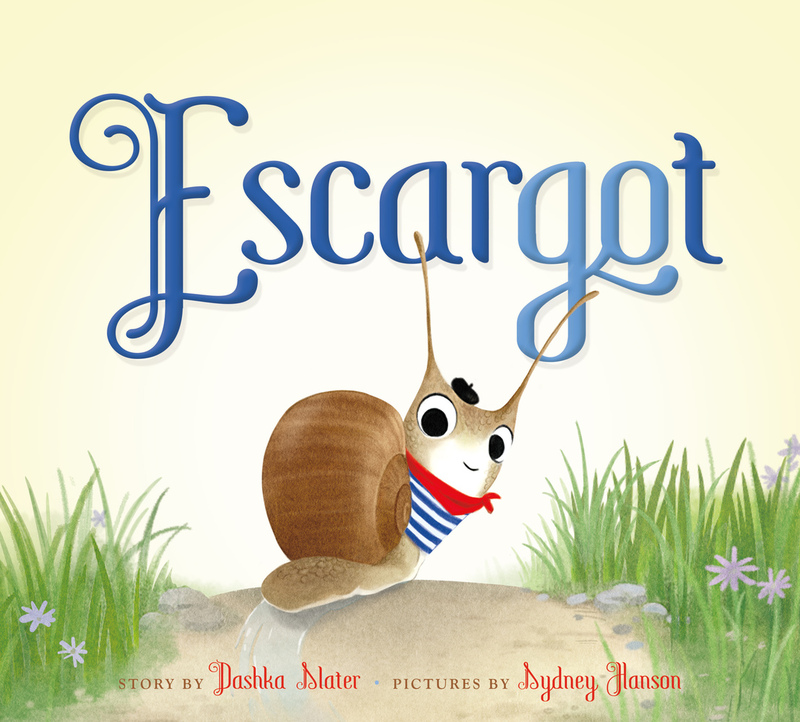 This entry was posted in Uncategorized and tagged Dashka Slater, Escargot, meta picture book, Perfect Picture Book Friday, picky eaters, snails, Susanna Leonard Hill, Sydney Hanson. Bookmark the permalink. Loved the carrot confrontation!!! Great pick! “Escargot will now make a fierce face at the carrot.” LOL Every kid who has stared down a plate of non-preferred foods will love that! I was one of those kids! I am neither fond of snails nor salad…but look at that cute little guy in the beret and the striped boater! Awwww! You’ve won my heart, snail, you’ve won my heart. Those wiggly antennae are fantastic substitutes for expressive eyebrows! All i can think of is that Escargot is a cooked snail… Very cute 🙂 Thank you for the smile! I hope the little ones won’t realize that Sue! He is a very charming gastropod indeed. Oh my goodness, what a cute book! Oo la la – it is enchanté indeed! I must confess that the sight of snails in my garden or on a plate has me cringing, but that little French snail on the cover looks endearing. I’ll be checking out this little treasure. Never on a plate – I agree Leslie! Wonder if I could use this book to get my son to eat his salad willingly. I promise I won’t ask him to eat escargot….. Yes! Or at least to make a fierce face at a carrot. Good luck! Snails are a bit rare around here – lots of slugs though! I also thought the lettering on the title was perfect – fancy but legible for little eyes! Oh I never saw the Pepe connection until you mentioned it – brilliant! And yes, the vinegar is très dangereux certainment! When I saw the title, the picture and the mention of the salad, I thought this story was going in a different direction. I like the theme of picky eaters and learning to test-taste foods. Adorable cover! Maybe that is a wink to the adult readers that will fly over the heads of young ones? I don’t know. Going to re-read the author’s “The Sea Serpent and Me” and “Dangerously Ever After” to get a better understanding of her approach. Oh my gosh, i was a little worried Escargot was going to end up in the salad. Phew! Mais oui! You are not alone -others feared the same. But snail salad? Yick! Yes -a charming snail. Who would have guessed at such gastropod personality! Haha.. Oh this is such a fun story, and gorgeous illustrations. Reminds me of our trip to Paris many years ago and being asked to try the snails. I’m afraid my hubby and I passed on that. Thankfully there is only salad on the plate in this book Diane! I agree with you – even those special tongs for snail-eating give me the willies!